Over half of mental health trusts in England have cut the number of beds for patients in crisis, despite the Government promising extra funding. ITV News sent a freedom of information request to all of the country's 58 mental health trusts. Thirty-two of them responded. We found that despite a Government pledge to invest an extra £1 billion into mental health services in England, 60% of Trusts have cut the number of beds available for mental health patients. The figures offer little evidence of savings being put into community-based services designed to reduce the need for inpatient treatment. Instead they paint a picture of a desperately overstretched system struggling to meet demand. When hospitals find themselves with no beds, they face a difficult choice of either paying private hospitals to take their patients or sending them hundreds of miles from home for an NHS bed. The Government has pledged that by 2021 no patient should ever face a long journey for mental health treatment. We asked each trust how far patients have had to travel when there was no room for them locally and what was their bill for private care. The response showed how a lack of capacity can have devastating effects for patients. Barnet Mental Health Trust in North London, for example, cut 21 beds this year. But it spent £2m on private beds - £700,000 more than last year. And one patient was sent 233 miles from home for NHS treatment when no beds were available. The number of beds cut by Barnet Mental Health Trust in North London this year. The number of beds cut by Cambridge and Peterborough NHS Foundation Trust this year. At Cambridge and Peterborough NHS Foundation Trust, 13 beds were cut. The longest distance a patient had to travel for treatment there was 177 miles. Remember, the Government has pledged that by 2021 no patient should ever face a long journey for mental health treatment. And only 11 months ago former prime minister David Cameron promised almost £1 billion of funding over the next five years in what was billed as a "mental health revolution". 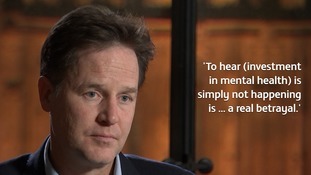 Nick Clegg, who pushed hard for mental health to be given parity with the treatment on offer for physical illness, told ITV News he believes promises are already being broken. We introduced a big shift during the time of the Coalition ... making very significant announcements about extra money for mental health, making sure it was a legal requirement to put mental health on the same footing as physical health. So to hear two, three, four years down the line that its simply not happening in practice is, in my view, a real betrayal. A spokesperson for NHS England said NHS investment in mental health services was "now rising faster than for other services". This includes investing £400m in crisis resolution home treatment teams from next year to increase provision of community alternatives to hospital admission, and to work towards a national ambition of eliminating inappropriate out of area placements for people needing acute inpatient care. A recent study by the Royal College of Psychiatrists indicated that more beds are not necessarily needed nationally and that mental health care should be provided as close to home as possible. But our figures show vulnerable patients are still having to travel hundreds of miles from their homes. Cutting beds to put more money into community crisis teams may be a laudable aim. But NHS England is under enormous pressure to pay off its burgeoning deficit. Reducing capacity before you have invested in the community crisis teams needed means getting help right now is tougher than ever.